COMMON COURTESY « THE BRYCE IS RIGHT! – A simple form of communications which reflects our character. I recently discussed the four basic types of personalities; A, B, C and D. In addition to the different personality types, we as humans have a wide variety of interests and non-interests (“turnoffs”), as well as highs and lows. As such, it is impossible to know precisely how to properly relate to everyone in every situation all of the time. The common leveler is common courtesy. By this I most definitely am not referring to “political correctness” which is concerned with pseudo-courtesy for political purposes. Instead, common courtesy represents a genuine respect for the human spirit and how we should interact. This is much more than just saying “please” and “thank you,” it’s treating others as we want others to treat us. Each day we transmit a series of messages which communicate how we regard others. This is done either verbally or through other means affecting our senses. These messages can either be perceived as positive or negative. For example, someone who dresses or smells badly is sending a message that he has no regard for the others around him, as does foul habits such as belching or flatulence. Conversely, good grooming means you care how people perceive you. Other positive messages are conveyed through such things as greetings and handshakes, punctuality, and simple manners. Common courtesy, therefore, is concerned with sending positive messages as opposed to negative. It also means our ability to practice common courtesy is a reflection of our character and how we want other people to treat us. In Japan, an introduction in a business setting is very important. In addition to identifying yourself, it establishes your professional image, and the superior/subordinate relationship for the two parties to assume (the “pecking order”). Consequently, the Japanese practice introductions carefully, particularly how a business card is presented, as they realize its importance. In contrast, people in the western world have a much more cavalier attitude towards introductions. Nonetheless, the introduction is every bit as important and sends signals as to how we perceive each other. A lot of people underestimate the importance of a handshake. Actually it is the single most important message we can convey in an introduction. Some people like to give a strong vice grip handshake in an attempt to intimidate you, but most handshakes today by young people are weak and flabby. Actually you need to find a good balance, not too flabby and not too strong. Further, look the other person square in the eyes when you shake hands, this conveys your sincerity in meeting the person. Do not trust anyone who simply shakes your hand but doesn’t look you in the eyes; they simply do not care about you. 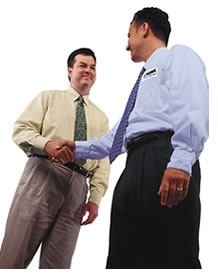 Shaking hands has historically been a very masculine custom, but this has changed in recent times. However, men still question the appropriateness of shaking a woman’s hand. Because of this, it is the woman’s responsibility to offer her hand. If she does not offer her hand, do not reach for it as she may feel uncomfortable doing so. Upon meeting someone for the first time, be careful about using the other person’s first name or nickname as this may be reserved for the person’s friends and family. Use “Mister”, “Ms”, “Mrs” or “Miss” depending on how you were introduced and allow them to say, “Please call me Joe.” But if by chance you ask, “May I call you Joe?” Don’t be surprised if someone says, “No.” In other words, do not risk embarrassment, let the other person make the offer to use their first name or nickname. And please, whatever you do, do not call the other person “Dude,” this should have gotten out of your vernacular after graduating from High School. It is also a good practice to memorize the other person’s name, particularly when a business card is unavailable. Nothing is more embarrassing in a business relationship to both parties than to forget a name. Write it down if you cannot remember it. * Inquiring about a person’s family (e.g., birthday observed, anniversary, graduation, pets, health, etc.). * Asking about an event the person recently experienced (e.g., attendance at an event, a trip, participation in a volunteer organization/charity, a new job or project assignment, etc.). * Commenting on something newsworthy – community, sports, weather (“What did you think about…?”). A good basic greeting can work wonders in building cooperation and relations between people. * Be observant – if there is anything constant in life, it is change. Change is always around us, but it takes a perceptive person to be able to spot the smallest of changes, whether it be a new hair style, someone losing weight, a small job well done, or whatever. When a change is observed, ask yourself why it has happened. Be inquisitive and understand the rationale for the change. This will help you adapt to the change as well as improve your interpersonal relations. For example, people are easily flattered when someone compliments them on a change. It means you are perceptive and interested in the person, both of which puts you in good standing with the other person. It is these little observations that go a long way. As an example, perhaps the best secretary I ever met was a lady named Myrna who worked for an I.T. Director in Chicago. The first time I visited the office, Myrna warmly greeted me and asked if I wanted a cup of coffee. Saying Yes, she then asked me what I wanted in it. I said cream and sugar, which she then made for me. Months later when I returned to visit the Director, Myrna greeted me by name and presented me with a cup of coffee with cream and sugar. Frankly, I was startled she not only remembered my name but how I also liked my coffee. Later I discovered Myrna maintained a simple card file; whenever someone visited the office, Myrna would record their name and the type of coffee they liked. Sharp. Very sharp. NEXT UP: AMERICAN RENAISSANCE – It is no longer business as usual. Upon meeting someone for the first time, be careful about using the other person’s first name or nickname as this may be reserved for the person’s friends and family. Use “Mister”, “Ms”, “Mrs” or “Miss” depending on how you were introduced and allow them to say, “Please call me Joe.” But if by chance you ask, “May I call you Joe?”, don’t be surprised if someone says, “No.” In other words, do not risk embarrassment, let the other person make the offer to use their first name or nickname. And please, whatever you do, do not call the other person “Dude,” this should have gotten out of your vernacular after graduating from High School.